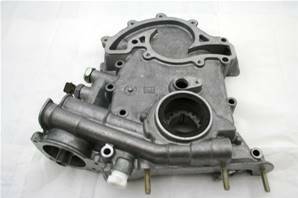 Original equipment front cover assembly - Oil cooler type. Don't get me wrong, it's definately okay. But I only have it this rating because there was a LOT of casting swarf left in the water pump inlet and outlet ports. Some of these swarf pieces were over an inch long. Nothing that a dremmel can't fix though :) Also the pump back face was not teflon coated like the original. The service I recieved and the speed of delivery was absolutely great! !! Top quality and service as usual!